Caribbean foods have a long history of commercial success, but the story behind the UK’s first ambient Caribbean soup is a unique one. George Shaw was well known for providing the best fresh soups at the popular Fillings take-away in London. 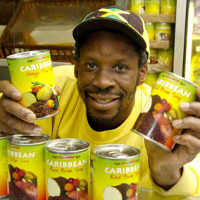 Then a turn of fate led him to bring a Caribbean flavour to the convenience soup market. Proving that inspiration can come at the least likely of times, George’s came whilst struggling for survival in the most dramatic of circumstances. It happened while he was recovering in intensive care from injuries inflicted upon him by a bank robber. As he recuperated, he began to notice that the lack of a decent convenient Caribbean soup was a repeated theme of conversation among the medical staff– the knowledge that he possessed the solution aided his recovery: ‘It was like a premonition: I knew I was going to live and knew I had a duty to make my soup available for everyone,’ he says. Bringing the taste of the Caribbean to a wide market was only achieved after three years of work on the product: ‘The success of the fresh soup in Fillings and at various carnivals in the UK proved that demand existed for this product; I just needed a way of preserving that authentic taste to bring it to a wider market.’ Canning sealed in the full flavour and ensured a long shelf life, and George launched his red bean soup in a canned format. All the hard work is paying off. ‘Over the past twelve months, we have already had notable success in selling our product.’ Papa Shaw Fillings have become popular with vegetarians and lovers of Caribbean cuisine alike.